What did you end up using as padding? Are the headrest/waist/shoulders all the same padding? I used a cotton quilt batting for all of the padding, stuff I had on hand. It's quite light, nothing like the shoulder straps on the Yano or Ergo. This would make the one-strap backpack fanatics at BYU go crazy........maybe that wasn't an issue when you were there, but when I was a freshman there, a huge debate in the Daily Universe focused on how women wearing one-strap backpacks (which are worn across the chest) gave the men immoral thoughts, and that they should be banned from campus. I thought it was the funniest/stupidest debate ever. Oh, I like this a lot! The only issue I'd have with the criss-cross is the boobsqwishing effect. I will def try though, because the regular backpack carry hurts my shoulders somehow. ps. I'm still learning the back carry with a wrap. The other day I ventured outside for a walk and M completely slipped out of the middle portion of the wrap! Eeek!!! Judit, I don't remember paying attention to NIP because it wasn't really in my radar. But people brought their kids to class all the time. You'd see couples handing off their kids to each other between classes. The baby would be in a backpack, and then the mom or dad would carry another backpack in front with all of their school books. And of course pregnant women all over campus. It was definitely NOT your average university experience in that sense. love it! I make a similiar MT style for sale and my godson just loves to suckle on the shoulder straps. We joke that corderoy must be really yummy! Or at least feel good on the gums. I really want one of these. As in REALLY, REALLY, REALLY! They look awesome, so I will definitely be consulting you before the next baby is born. Just wait till you see the soft structured carrier I am making. I haven't named it yet, but it's a cross between an Ergo and a Yano. With removable & reversible slipcovers so you can change the fabric on the body panel. It's a Yamo, not Yano, by the way. I got one of the shoulder straps padded today (thanks to a long pair of pliers that we usually reserve for plumbing jobs). And the waistband is done. Just need to put everything together...then of course I have to make myself more than one because I simply can't decide on one fabric or color scheme! OOh Rixa I am so impressed and excited! I looked at fauxhawk and Eden and Kozy, but it seemed like I never had the 90 bucks when I was looking. I would really, really like one, and I don't care about the criss-cross straps, I care about having arms free to live and move. 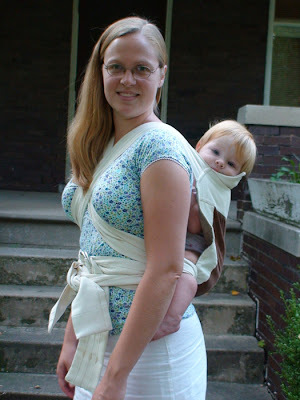 I have an Ergo (old style) and it was nice for a while with baby Casey, but it isnt perfect by any means. Especially if your baby is tall, they cant truly sleep in it. I made my own fake baby hawk today too, with no pattern. It turned out really well and I'm so excited! You're looks great too!